Just 7% of consumers say that customer service experiences they have with companies typically exceed their expectations. Now think about how you could succeed and profit as a business if you not only continually offered good service to your customers, but also frequently offered more than what they expected. 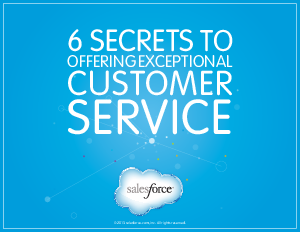 The secrets to lining up your customer service with your brand. The best way to train employees. How to make employees feel good about giving great service. The significance of monitoring customer interactions. Which customer metrics you should pay attention to. The cheapest way to earn new customers. Download this ebook to learn what you need to do to give customers what they want and earn a customer for life!